For new drivers, driving can be totally liberating. For the first time, new and young drivers have the ability to travel long distances on their own, completely undisturbed. It is important at this stage to avoid picking up bad driving habits, and ensure safe driving practices. Every time you get behind the wheel, you should be completely focused on the road. 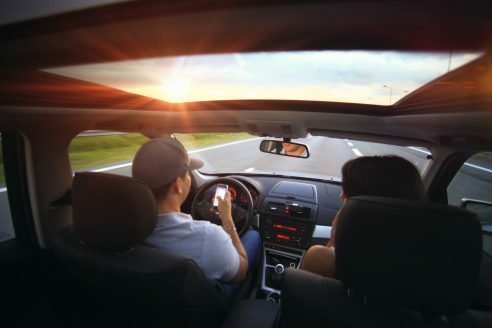 Eating, texting , reading, or checking yourself out in the mirror while driving are all examples of distracted driving that commonly contribute to accidents. Speeding is a dangerous habit that starts early and is difficult to shed. Speeding drivers are not only putting themselves at risk—they are endangering the lives of everybody else on the road. Following too close to a semi-truck is extremely dangerous and should be avoided at all costs. When turning, allow semi-trucks extra room and never put yourself in their blind spot for an extended period of time. Seatbelts save over 13,000 lives per year. Why risk it? Clipping in your seatbelt as soon as you get behind the wheel is an important habit to start practicing early on. A brief glance in the mirror is not sufficient enough when it comes to changing lanes or passing vehicle on the road. In order to tell if a car is in your blind spot, you must turn your head and glance over your shoulder. In Canada, approximately four people are killed in crashes each day because of an alcohol or drug-related accident. Signs of an impaired driver include unnecessary speeding, slow response to traffic signals and signs, tailgating, and dangerous drifting or changing of lanes. Turning or changing lanes without signalling to other cars is extremely dangerous and can lead to unnecessary accidents. If a car is in your blind spot, or pulling out of a driveway up ahead, how are they supposed to know you are turning? Most of the time, driving through a yellow light is relatively safe. Speeding through a late yellow, however, is very dangerous and can lead to serious collisions—and a ticket. In some provinces, there are ticketing systems installed at intersections, and the fines are hefty. To ensure a safe driving experience throughout your life, it’s important to avoid bad habits early. If you have any questions about safe driving, or are looking to sign up for driving courses, the professionals at Ambitious Drivers are here to help. Contact us today for more information.